Life as a wildlife rehabber is both rewarding and heartbreaking. We live, love, and devote ourselves to the animals we rescue. Our successes drive us on to help more, and our losses make us swear we will never take on another animal as long as we live. And then, there are animals who touch us in such a way as to meld with our souls like nothing else. For me, this happened when a bouncing three-week-old baby raccoon got sent to me by a fellow rehabber. I named him Rodney, and he has enriched my life and my love for vodka. Keeping a raccoon is not recommended FOR ANYONE. It’s like having a two-year-old on steroids. They get into EVERYTHING and forget having nice furniture or anything to sit on that isn’t shared with a fat varmint. Your stuff is their stuff. And they don’t share their stuff with anyone. Rodney has a propensity to steal, all raccoons do. The Native Americans called them little thieves and the name is justified. My biggest problem with Rodney is his love of handbags. 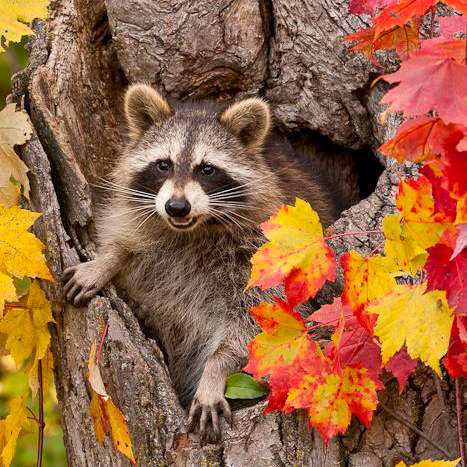 If anyone comes over, we have to make sure all their belongings are stored ORR–out of raccoon range. When you first have to describe why you are putting a lady’s handbag on the top shelf of a closet door secured with a latch, you tend to get a lot of odd looks. And then Rodney walks into the room. The sight of him has sent more than one person running for the door. My mother-in-law refuses to enter my home, which can be a good thing. Needless to say, we used to have friends. We don’t have them anymore. Being the people with the raccoon that crashes dinner parties put our entertaining on hold. In fact, having anyone in our home usually means some preparation on our part. Secured in his room, Rodney has his TV set to his favorite movie or show (he loves Game of Thrones). He’s also given a snack. Unlike a dog who sniffs in inappropriate places, a raccoon will go through your crevices like a jumpy TSA inspector at the airport. Pockets get turned out, shoes get sniffed—even the soles get padded down. He has to check out every inch. Being related to bears, raccoons rely on their noses a great deal. But to the average person, it can get intimidating. At least we know there won’t be any incendiary devices getting through our front door. Rodney would sniff it out. Makes you wonder why the TSA hasn’t grasped the concept of using Raccoons instead of people for those body searches. Admit it; who could say no to such a beautiful face. It would give “getting groped at the airport,” a whole new meaning.